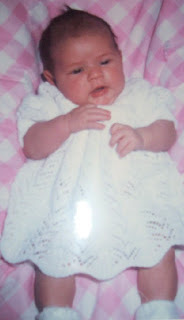 This is one of the few pictures we have of my sweet little sister Allison Marie before she passed away at 7 1/2 months of age. She was apparently an amazing baby and such a joy. I can only hope my S is as wonderful as she was. So far so good! It will be fun to see if S resembles Allison as she grows older. I can already see some similarities. Anyway, here is my little sister who we miss so very much.